BentoLunch.net - What's for lunch at our house: Just Ben Monday! Today was parent conference day at our school, so while Ben & I headed off to our respective schools, Faith headed off to my friend Chantel's for a day of fun with her buddy Hannah. And that meant I only had to make one lunch, so I decided to make it easy on me and just give the boy his favorites. How do you not smush the bread when you're cutting it out? I always smush it and it's not that pretty! I roll it flat first. :o) It cuts better and doesn't tear as much. Anyway, what a great bento! 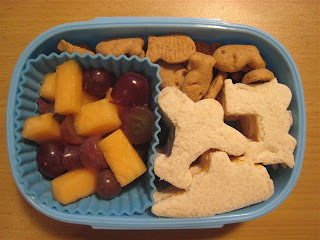 I like the shaped sandwiches and the cup of fruits.